"Any manufacturer planning on shifting from Mass Production to Mass Customization had better understand that it is a company-wide initiative, not something just for manufacturing. Learn how to make it your business strategy by reading David Gardner's insightful, practical book. And if you're not planning on shifting to Mass Customization--you better read it all the more." Epilogue: Is The Mass Customization Journey Worth It? Manufacturers with highly-configurable products face daunting challenges to create the flexibility, transparency, and customer experience that delights customers without undermining profits. If a company continually experiences the pain of not being able to seamlessly connect the customer to the enterprise and efficiently drive order demand across the enterprise, the business is not set up properly. There is a misalignment between the company's infrastructure and the actual business requirements. This book explains how to bring a company into alignment. While much has been written about mass customization as a high-level strategy, much less has been offered about implementing mass customization as a business strategy. Manufacturers that thrive in the 21st century will treat customers as "insiders." Under mass customization, a customer is an "insider." The customer can select from an array of choices to purchase products that match their individualized needs. This book explains mass customization (also known as build to order, assemble to order, configure to order, make to order and engineer to order) from the standpoint of discrete manufacturers and reviews why mass customization must be viewed as an enterprise-wide business strategy, not merely a departmental initiative. Companies with highly-configurable products need to combine the technical superiority of their products with operational excellence. A manufacturer needs to be able to seamlessly connect the customer to the enterprise so the hand-offs from organization to organization are efficient and keep the process moving forward to a timely completion and delivery. 'Mass Customization' is for anyone whose company faces a constant, uphill challenge with respect to quoting, configuring, and producing high-configured products; any company that has made an investment in product configurator software and wants to understand why operational efficiencies and profits haven't improved, and anyone who would like to get a better understanding of what is required to implement mass customization as well as the power mass customization has to transform certain businesses and industries. "Dave Gardner brings years of experience and an intuitive sense of the well woven fabric of excellence. All of this is evident in his new book that should be in the toolbox of anyone seeking to compete successfully in the future global economy." "As an executive whose organization richly benefited from the concepts and practices described in this book, we went from a poor respondent to customer needs to a best responder--along with better revenue and, more importantly, more profit. Thanks for taking the time to write this book--many people will benefit I know." "Dave Gardner is the 'go-to' guy if you need to fix the operational challenges associated with highly-configurable products." Guy Gandenberger, VP of Worldwide Operations & Foundry Business Unit, Micrel, Inc.
"Dave Gardner's insights on how to implement mass customization will help companies address the tough challenge of how to better meet customer needs and simultaneously reduce costs." Alan Fortier, President, Fortier & Associates, Inc.
"Using 21st Century technology to streamline 20th Century business models is a waste of time and money. Unfortunately, that is the approach most organizations seem to take � try to make stale, old, and obsolete ideas more effective through technology. 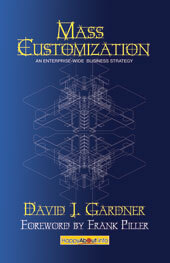 In "Mass Customization: An Enterprise-Wide Business Strategy," Dave Gardner provides a clear and convincing argument that the circumstance that made mass production relevant in the 20th Century no longer exist and that 21st Century business demands not only a change in systems, but an enterprise-wide change to a mass customization mindset. This book is a must read for all discrete product manufacturers." Douglas T. Hicks, CPA, CMC, Cost Measurement and Management Consultant, D. T. HICKS & CO.
"I found this book to be extremely insightful. This isn't just for manufacturing leaders. I encourage executives across the enterprise (sales, marketing & engineering) to read and learn from this book." Brian Gant, Manager, Global Engineering and Ops, Cisco Systems, Inc.
"'Mass-Customization' paints a clear picture of why manufacturers need to embrace mass customization, and more importantly how they can make this work. Dave Gardner does a fantastic job of clarifying the implications of this strategy for the entire organization." 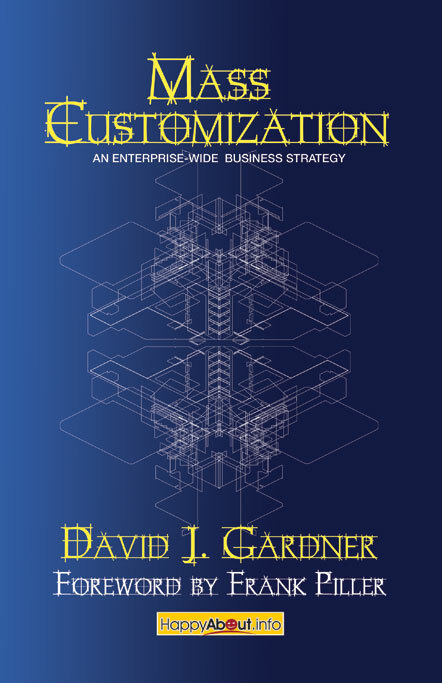 "David has summarized his years of experience in implementing the elements of a sustainable and profitable mass customization system in diverse business settings. He is one of the few individuals in the world that really have researched and executed mass customization thinking in a consistent and pragmatic way. So I am sure that you will benefit tremendously from reading his advice and reflections to better understand how you can build for your company a full set of mass customization capabilities that sets your business ahead in these tough times." "Gardner's work targets a major competitive threat to all mass producersthe inability to customize effectively from product management to customer installation and acceptance and through to ongoing customer support...and it is critical. His insights demonstrate that embracing and adopting a mass customization capability is key to long run competitive success. He makes his case for the mass customization adopters as winners in our highly competitive world."